The Short Version: Choosing an engagement ring for your loved one can be an intimidating task. As you browse similar sparkling choices, it helps to know what makes one diamond worth more than another. The International Gemological Institute (IGI) provides educative lab reports that summarize the noteworthy characteristics of diamonds, gemstones, pearls and other jewelry. Since 1975, the institute has adhered to strict international standards regarding the quality of diamonds, offering an independent quality assessment for consumers. The IGI’s certificates lend everyday shoppers greater confidence when buying jewelry. Before you get down on one knee, the IGI can give you the resources and knowledge to make sure you have an engagement ring that’ll take his or her breath away. Picking out an engagement ring is an emotional experience. It’s easy to get overwhelmed at the jewelers by all the sparkling and expensive rings. Everything is so beautiful, and it’s often difficult for a layman to distinguish one diamond from another. When you choose an engagement ring, you’re making a lifetime commitment, and not every boyfriend or girlfriend is qualified to make such a weighty decision on their own. The International Gemological Institute (IGI) uses a universal grading structure to rate diamonds from an objective standpoint. IGI lab reports break down the important characteristics of the diamond — including the Four Cs of carat, color, clarity, and cut — to help consumers make an informed decision when picking out jewelry intended for someone special. 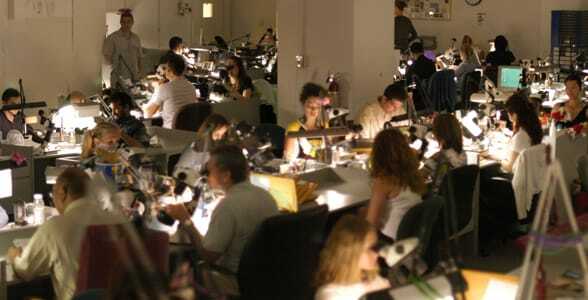 In operation since 1975, the International Gemological Institute has more lab locations worldwide than any other diamond laboratory and is a trusted name in the gemological world. These certified diamond experts offer independent information about the makeup of diamonds, gems, and jewelry. The institute’s lab reports empower shoppers to assess the quality of their jewelry, compare prices, and pick out a diamond that’s perfect for them. When buying an engagement ring, it helps to have an impartial group of experts explaining what each diamond is worth in terms of objective characteristics rather than sentimentality. Plus, a credible lab report can come in handy down the line, if you have to resell or make an insurance claim on a jewelry item. Many jewelry shoppers can benefit from the reputable guidance provided by the IGI. The institute offers consumer-friendly tips on everything from buying a diamond with confidence to caring for your jewelry. The lab reports accurately describe the notable qualities of individual diamonds, colored stones, and other jewelry. The IGI team can also laserscribe your diamond with a report number or personalized message so you can always identify it as yours. 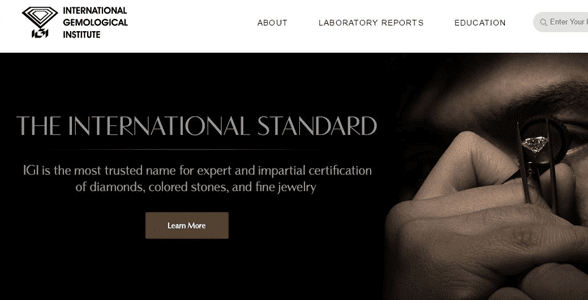 The IGI’s lab reports educate consumers on the characteristics of a piece of jewelry. 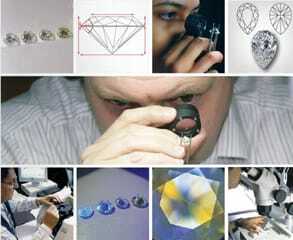 Expert lab workers use state-of-the-art technology to identify the properties of diamonds and gemstones. A detailed report describes exactly what you’re looking at — even identifying synthetic diamonds. The International Gemological Institute knows diamonds. In authoritative Diamond Reports, lab reporters use plain language to rate diamonds according to universal standards of diamond quality (colloquially known as the Four Cs). By accurately grading a diamond’s carat, color, clarity, and cut, the IGI seeks to add a fifth C to diamond buying — confidence. The report sums up everything consumers need to know about a diamond, from imperfections to color grade, so shoppers can use their heads as well as their hearts to pick out stunning and affordable diamond jewelry. The IGI assesses the symmetry, polish, and value of natural and lab-grown diamonds. Maybe it’s not your engagement. Maybe it’s just a Tuesday. Whatever the occasion, buying jewelry for a loved one is never a bad idea, and the IGI can assist you in picking out jewelry with excellent craftsmanship. Shoppers enjoy greater confidence when picking out a piece of jewelry certified by the IGI. 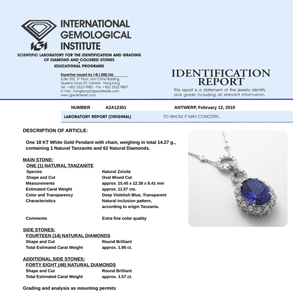 IGI was the first lab to develop jewelry identification reports for consumers worldwide. Today, the Jewelry Reports provide unrivaled and impartial analysis of a jewelry item’s precious stones. Documentation will describe the color, natural origin, detail of mounting, total carat weight, and other notable attributes of rings, earrings, pendants, heirlooms, and other complex pieces of jewelry. The IGI also weighs in on the quality of colored stones such as rubies, sapphires, and emeralds. The IGI Colored Stone Report analyzes the shape, cut, weight, measurements, color, transparency, and other optical characteristics of the stone, so consumers can feel secure in the quality of their purchased gemstones. The certificates provided by the IGI add a layer of trust to the gemological world and ensure fair transactions between jewelers and consumers. 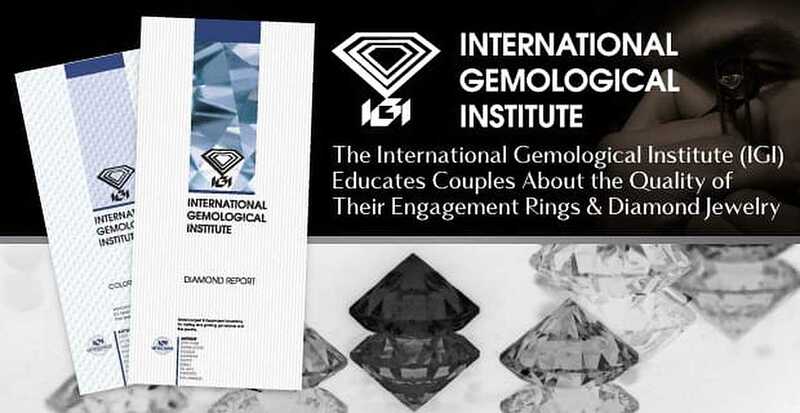 If you’re looking to get your significant other something sparkly, the International Gemological Institute can give you much-needed guidance in your selection. Since 1975, the IGI has endorsed international grading standards and raised awareness about what makes a diamond worth so much. The institute’s educational resources are a great boon to couples selecting pieces of jewelry to commemorate engagements, anniversaries, or other special events. If you want to take it a step further and actually become a certified diamond expert yourself, you can benefit from training at the IGI’s School of Gemology. The school operates out of 12 locations worldwide, including Antwerp, Mumbai, Shanghai, and New Delhi. The IGI’s hands-on courses typically last for a three-month term. Students can enroll in the graduate gemologist or the diamond graduate programs to gain a working knowledge about jewelry design, retail support, pearls, colored stones, polished diamonds, and other gemological subjects. Over time, the IGI has developed groundbreaking techniques to grade diamonds and gemstones. IGI’s one-of-a-kind curriculum caters to professional jewelers who want to learn how to identify, assess, and price pieces of jewelry. The IGI School’s enrollment form can be found online. Every detail of a marriage proposal matters because it becomes part of your story as a couple. Where did it happen? How did it happen? What did the ring look like? Arguably, the ring is the most important part of the proposal because it will be the symbol of your marriage for the rest of your lives. Something you could even pass on to your children or grandchildren one day. By relying on IGI’s expertise, consumers can walk into a jewelry store with confidence and know exactly what they’re buying. In one sheet of paper, you’ll see everything you need to know about the quality of the engagement ring. The institute’s independent lab reports clearly and accurately judge the important aspects of a particular diamond, colored stone, or other piece of jewelry. With their assistance, you can pick out the perfect diamond ring for your loved one.